Genuine HotSpring custom fitted thermal lid with 2 lb. density foam core. Price includes delivery but does not include fitting. Hot Tub Cover Replacements keep your hot tubs energy bills down. For maximum insulation and energy efficiency, replace your old hot tub cover with a genuine new HotSpring, Limelight, Hot Spot or Tiger River hot tub cover. Custom fit for your HotSpring, Limelight, Hot Spot, Tiger River or Solana Model Hot Tubs to seal in the heat. Thick foam core increases heat-retaining R factor. Marine grade vinyl exceeds industry UV and chlorine resistance standards. Earn up to 2,150 Bonus Bubbles. Hot Tub Cover price includes delivery but does not include fitting. Delivery not available to Highlands or islands. Fitting is available at a cost of £108. Please choose 'Installation & removal of old cover' from the optional extras to add this to your order. Additional charges may apply if you live further than 50 miles from a HotSpring World showroom. We have many hot tub covers in stock but PLEASE ALLOW 8-10 WEEKS FOR DELIVERY in case we need to place a special order for you. (We order our hot tubs and hot tub cover containers every week). We will always check our records or contact you to ascertain that we provide you with the correct hot tub cover for your spa. 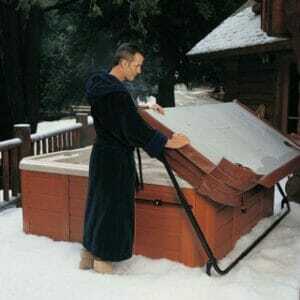 We only sell genuine hot tub covers for our hot tubs and spas.